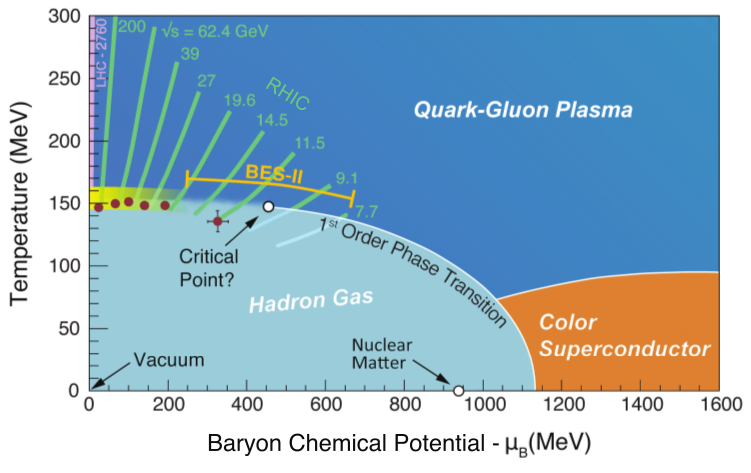 Lattice QCD calculations at non-zero temperature and baryon chemical potential allow the exploration of the transition and crossover lines separating the low temperature hadronic phase from the quark-gluon plasma phase. 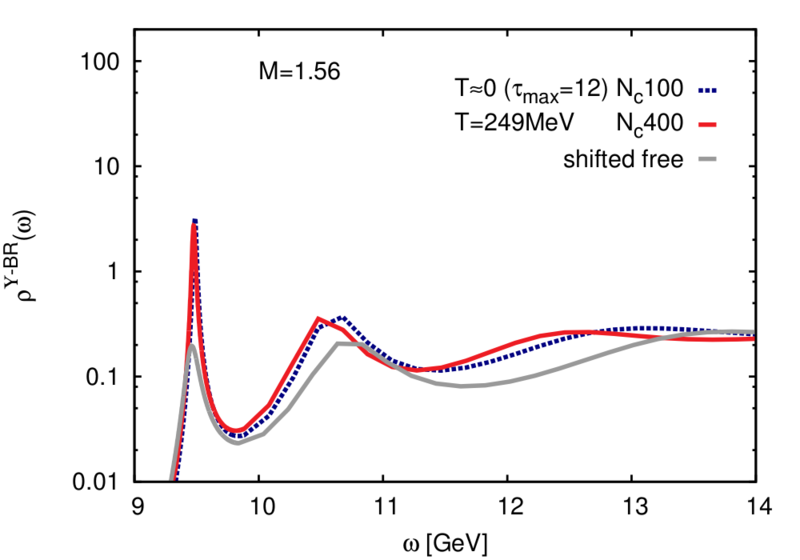 They also allow the quantification of the relation between the experimentally measured freeze-out curve and the crossover transition line (red circles in the figure, arXiv:1208.1220 [hep-lat]). The phase diagram is taken from the NSAC 2015 Long Range Plan for Nuclear Physics. At low temperatures and densities ordinary hadrons are the prevailing degrees of freedom that determine the properties of nuclear matter. However, under extreme conditions of high temperature or of high density (or both) this is expected to change. The theory of strong interactions (Quantum Chromodynamics (QCD)) predicts that a phase transition or crossover occurs that separates the low temperature/density regime of ordinary hadronic matter from a high temperature/density region where quarks and gluons, the basic constituents of QCD, become the most relevant degrees of freedom. Deriving detailed predictions for the properties of matter at high temperature and density directly from QCD is paramount in shaping our understanding of nuclear matter in general, as well as for understanding the evolution of the early universe. Large experimental programs at the Relativistic Heavy Ion Collider (RHIC) at Brookhaven, USA, and the Large Hadron Collider (LHC) in Geneva, Switzerland, exist which explore the properties of matter at high temperature and/or density, with the aim of mapping the boundaries between different phases of strongly interacting matter, and determining quantitatively the properties of matter in this domain. At RHIC a dedicated research program, the Beam Energy Scan Program (BES), has been established that searches for signatures for the existence of a critical point in the phase diagram that marks the starting point for a line of first order phase transitions. This is illustrated in the phase diagram displayed to the right. Lattice QCD foster this search through calculations of the equation of state of hot and dense matter, the calculation of conserved charge fluctuations as well as predictions for the modification of hadron masses, in particular the heavy quarkonium bound states, in strong interaction matter. The energy density minus three times the pressure, the pressure and entropy density of hot strongly interacting matter divided by appropriate powers of the temperature. These bulk thermodynamic observables have now been calculated with two different lattice discretisation schemes (stout and HISQ) and have been extrapolated to the continuum limit (arXiv:1407.6387 [hep-lat]). The ratio of strangeness and baryon number chemical potentials needed to reproduce the production of multiple strange baryons measured by STAR in the RHIC beam energy scan and by NA57 at the SPS (CERN) at two different values of the colliding beam energies. This also fixes the temperature (T) at which these baryon got produced. For details see (arXiv:1404.6511 [hep-lat]). Bottomonium spectral functions reconstructed from the NRQCD lattice calculations on lattices with temporal extent Nt=12 using a novel Bayesian approach. Shown are the spectral functions at T=249 MeV and T=0 as well as the Bayesian reconstruction of the free spectral function that does not have bound state peaks (Seyong Kim, Peter Petreczky, Alexander Rothkopf, Phys. Rev. D 91, 054511 (2015) ). For details see (arXiv:1409.3630 [hep-lat]). The behavior of strongly interacting matter in the vicinity of the phase transition or crossover is inherently a strong coupling problem, which can only be studied from first principles through lattice gauge theory calculations. Among the issues that can uniquely be addressed by lattice calculations are the nature of the transition, the temperature at which it occurs, the equation of state and various properties of the plasma that characterize its non-perturbative structure. Indeed, numerical calculations that are performed within the lattice regularized version of QCD have given us the best estimates of the temperature of the transition from hadronic matter to the quark-gluon plasma. Properties of this transition, the transition temperature, its bulk properties like the equation of state or the velocity of sound in hot and dense matter are studied extensively using computing resources on leadership class computers as well as on clusters operated by USQCD at Jefferson Laboratory and Fermilab. This leads to a determination of the transition temperature Tc=154(9) MeV, and calculations of the equation of state, the velocity of sound that characterizes the expansion of dense matter formed in heavy ion experiments, and several other properties of this new form of matter. The upper figure on the left shows the energy density minus three times the pressure, which is a measure for deviations from a non-interacting thermal medium. Also shown are the pressure and entropy density of strongly interacting matter as a function of temperature for zero net baryon number density. Continuum extrapolated results are shown for two different discretizations schemes labeled 'stout' and 'HISQ'. A fundamental set of experimental observables that are being analyzed in the Beam Energy Scan at RHIC are fluctuations of conserved charges (baryon number, electric charge, strangeness) and their higher order cumulants. These are considered to provide unique signatures for a possible critical point in the QCD phase diagram. Lattice QCD calculations of cumulants of conserved charge fluctuations allow to pin down the freeze-out conditions, i.e. the thermal parameters at the time hadrons form again in the sufficiently cooled down strongly interacting medium of quarks and gluons. Calculations of these observables are computationally demanding. State-of-the-art results have been obtained on the USQCD and DOE operated GPU cluster at Jefferson National Laboratory, Fermilab and the BlueGene/Q at BNL. Substantial resources for these calculations also come from an INCITE grant received by USQCD that provides access to leadership class computers at Oak Ridge (Titan) and Argonne (BlueGene/Q). The middle figure on the left shows results from a calculation of quadratic fluctuations of net baryon number, electric charge and strangeness as well as their cross-correlations. These observables allow to calculated the ratio of strangeness and baryon chemical potential that is needed to describe a strangeness neutral system at any value of the temperature. Comparing with experimental data on particle yields allows to determine the thermal parameters required for the production (freeze-out) of strange baryons in ultra-relativistic heavy ion collisions. 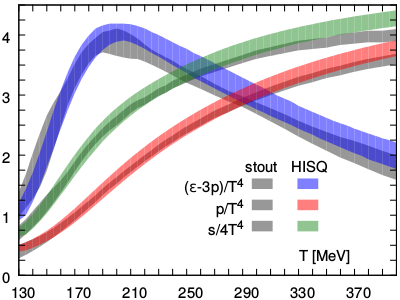 The suppression of quarkonium yield in heavy ion collisions relative to the scaled proton-proton collisions was proposed by Matsui and Satz as a signature of the formation of deconfined medium. The basic idea behind this proposal is that due to the color electric screening the interaction between the heavy quark and anti-quark becomes short range and the formation of heavy quark bound states will become impossible for sufficiently high temperature. Studying quarkonium production in heavy ion collisions is a large part of the experimental program at RHIC and LHC and the interpretation of the experimental results hinges on the knowledge of quarkonium dissociation temperatures or more generally on their properties at non-zero temperature. The in-medium properties of quarkonia and/or their dissolution is encoded in the spectral functions. Heavy quark bound states appear as peaks in the spectral function. Absence of any peak structure indicate dissolution of quarkonium states. To determine quarkonium spectral functions one has to calculate current-current correlators on the lattice and find the spectral function by inverse Laplace transform using Bayesian methods. For heavy quarks this is done in the framework of non-relativistic QCD (NRQCD). Using gauge configurations generated during the calculations of the QCD equation of state, bottomonium correlators and spectral functions have been calculated. 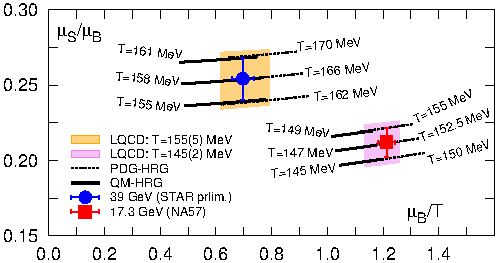 The Upsilon spectral function calculated at a temperature of about 1.5 times the transition temperature to the high temperature quark-gluon plasma phase, T=249 MeV, is shown in the bottom figure on the left.